Jelly Level 177 Cheat #2: Make other candy combinations work for you. In Candy Crush Jelly Saga level 177, orange candy matches are of the highest priority. However, they may not always be possible to achieve. In such cases, know how to use other candy combinations to your advantage. 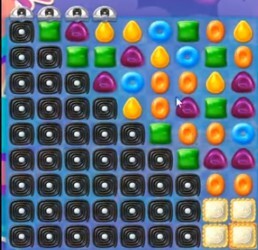 Study the board carefully to find out where other colour combinations could cause a chain reaction that would indirectly cause orange candies to merge; therefore, clearing the board while achieving the objective. Give higher priority to those reactions that would result in large orange candy combinations. In Candy Crush Jelly Saga level 177, colour bombs are also very important. Therefore, try forming as many as possible and as close to each other as you can. ; This requires patience and foresight and may use up a lot of moves but the result is worth it. Use the two colour bombs together to clear the entire board.